Catching up on commitment from around the state is a full time gig in itself. 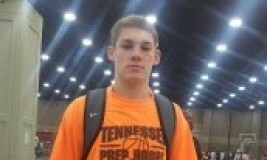 In Middle Tennessee, Jacob Williams (Wilson Central) has decided to take his game across town and play for venerable coach Sam Harris and Trevecca-Nazarene. Coach Harris is in his 21st season at the helm of the Great Midwest Athletic Conference member. Trevecca plays in NCAA DII. Clay Hertel (DCA) parlayed an outstanding senior season into a heated recruiting process but in the end Berry College will get the services of the talented shooting guard. Hertel, a Mr. Basketball finalist, will join the Vikings who toil in the Southern Athletic Association Conference of DIII. The Vikings are coached by Jeff Rogers. Bryan College adds their 150th recruit from the 2014 class with the addition of Reagan Johnson (Mt. Juliet). The Lions and coach Don Rekoske's class has been dubbed "The Dirty Dozen" so please just add one more to that formula. The Tigers of Sewanee reach into Nashville and grab a potential all-conference player in Jacob McCullough (Hendersonville). Coach Bubba Smith is at the helm of the Southern Athletic Association Conference school. Virginia-Wise will be the destination for the one they call Bizzle. Deonta Bizzle-Brown (Hardin Valley) will play his college ball for the Cavaliers and coach Blake Mellinger. UVA-Wise plays in the Mountain East Conference of NCAA DII. Junior colleges are the beneficary of talent as the game gets into the later stages. Out West, Antorian Moore (Hillsboro) heads to Kansas to play for Brady Trenkle and the Garden City Community College squad. T.Q. Brewster (Raleigh-Egypt) moved to the Midwest as he will play for Ancilla Junior College in Plymouth, Indiana. Missouri State-West Plains Junior College will be the destination of fellow Memphian Keion Peoples (Hamilton) while Keith Collins (Houston) heads up North to play for Wabash Valley Junior College. Kendrick Thompson (Cleveland) heads down to sunny Florida as he will play for Daytona State Junior College. The Falcons are coached by Ryan Ridder. Staying in Tennessee the members of the TJCAA (Tennessee Junior College Athletic Association) will bring in a horde of players. At Cleveland State, Coach Lee Cigliano welcomes Taylor Bentley (Bradley Central), Dominique Gooch (Siegel) and Austin Harwood (Walker Valley). Luke Primm (Community) will head down the road and attend Volunteer State and venerable mentor Rusty Melvin. Roane State welcomes a pair of newcomers in Dylan Reppart (Daniel Boone) and Chris Cook (KJnoxville West). Second year mentor Matt Sligh has Motlow State up and running and the success will continue with the addition of Reid Pierce (Blackman) from Class AAA state champion Blackman. Walter's State looks to the future with two big signees Zeke Clark (Elizabethton) and Kin Webster (Hillsboro).